Over the last few months I had the pleasure of working with Liza and Matt. They are a newly engaged couple who knew exactly what they wanted in a home. They wanted a place to entertain their friends and family in a relaxed environment, with a good size yard for a garden and their dog Sadie. Oh, and they wanted the home to be within their budget and in Berkeley. Yes, it is true that Buyer's have an advantage in this market, but it took some time for the right house to come along. 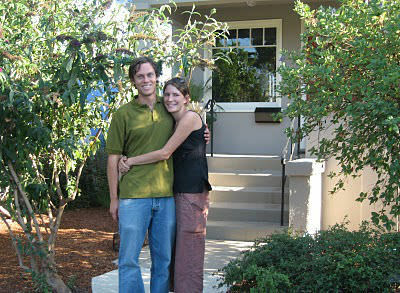 Yesterday, Liza and Matt just closed escrow on their new home on Blake Street! Congratulations! I want to thank them, as handing them the keys to their first home was sheer bliss to me. I feel honored to be a part of a significant event of their lives.